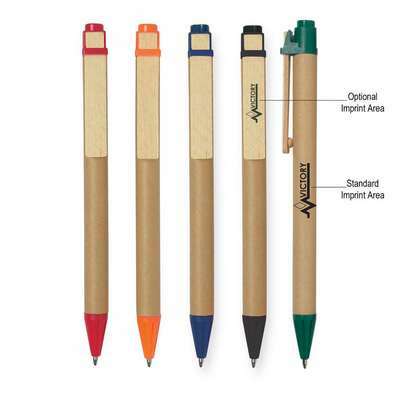 Imprint area: Barrel: 1 ½" W x 5⁄16" H, Optional Clip: 1" W x 1⁄8"
The Eco- Inspired Pen has a paper barrel, with a wooden clip, making it ecofriendly. It is available with black ink and a medium point. . The pen has a plunger. It has a simple and elegant look. Use it as a giveaway, to promote your brand: at trade shows, seminars, schools, workshops, and colleges, to reach a wide customer base and successful promote your brand as one that cares for the environment.